The first hour of the day saw a rather bizarre brief hyper-strong reversal from -2% to +11%... but then renewed downside melt. 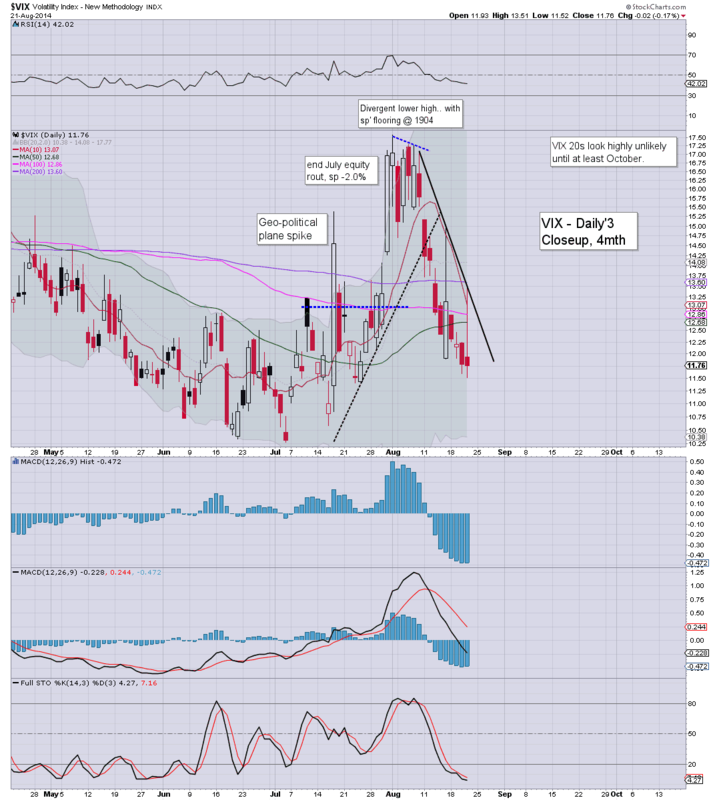 The VIX settled -0.2% @ 11.76 (intra low 11.52). 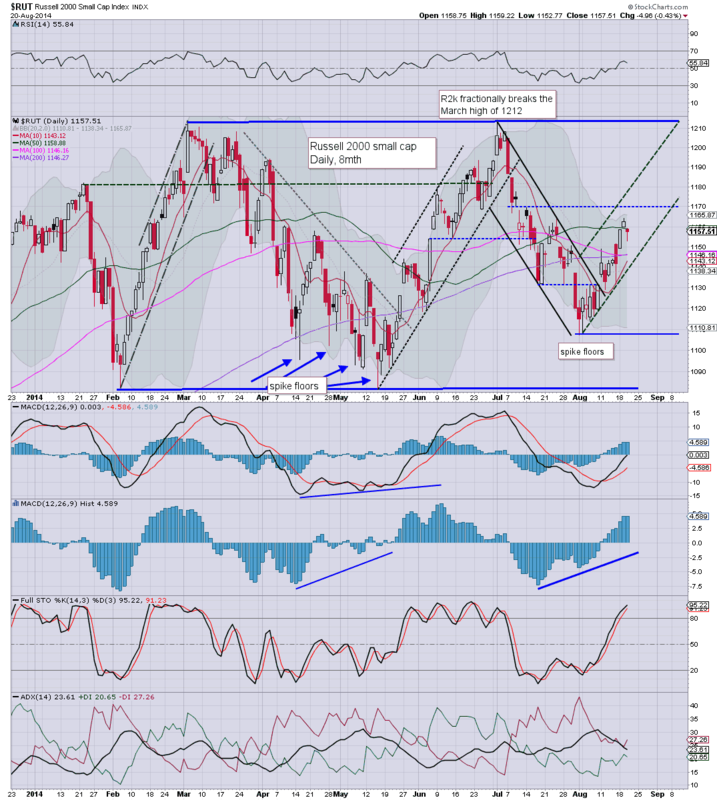 Near term outlook is for the 10s, 9s seem likely (if briefly)... at some point. I'm not sure what to make of the first 30 minutes of VIX trading. I'm sure someone out there has a valid explanation.... I wish I knew. 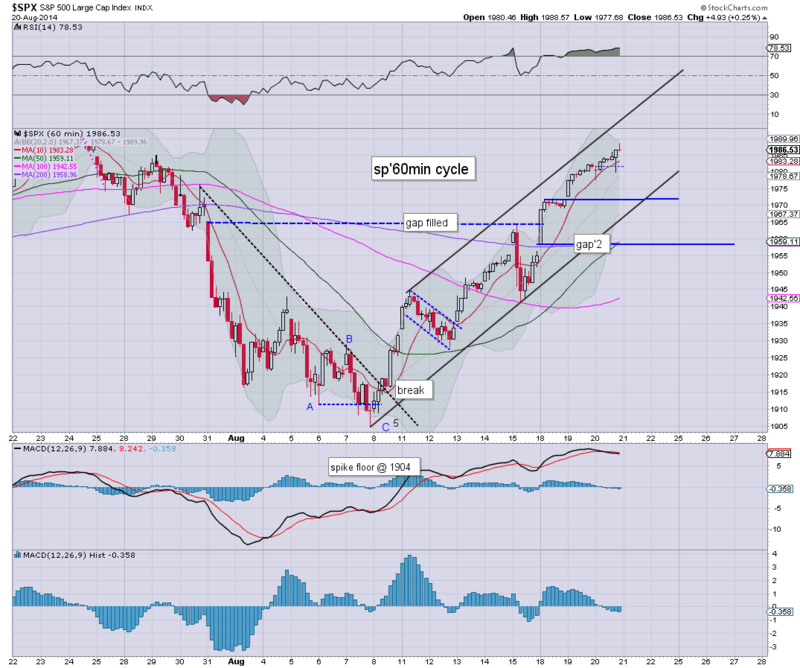 It is interesting that we got stuck right at the descending trend - see daily chart. VIX looks set to remain low for another few weeks. The upper price gap zone in the 15s remains a viable target on any 2-3 day equity sell down. The big VIX 20 threshold looks very unlikely to be hit until at least October. US equities closed generally higher for the 8'th day of 10, sp +5pts @ 1992 (new historic high 1994). The two leaders - Trans/R2K, settled -0.4% and +0.2% respectively. 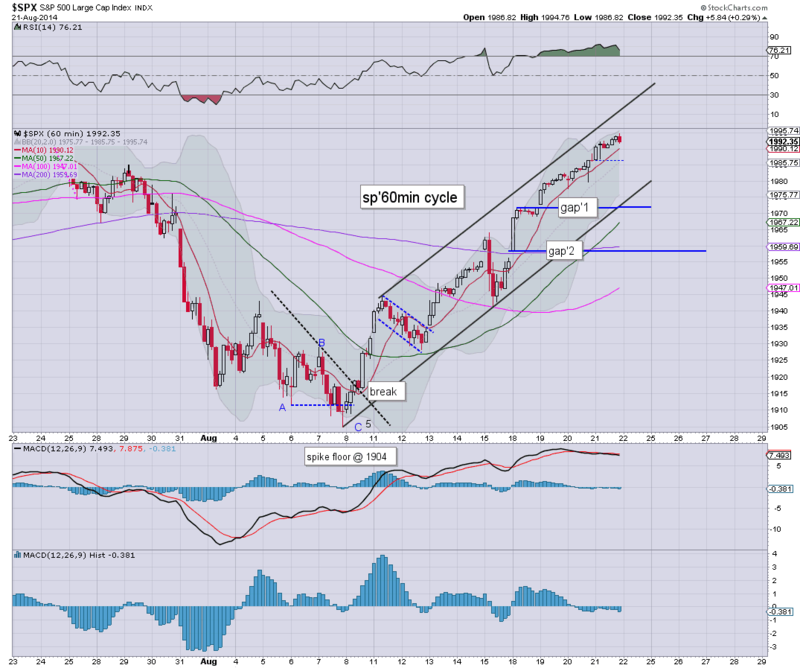 Near term outlook is for sp'2000s tomorrow, with 2010/20s in late August. So... another up day.. and what was especially impressive was seeing the R2K rebound from a morning low of -1.0%. The closing daily candle on the R2K was a clear spike floor, and bodes strongly for the bulls tomorrow..and into next week. *I remain content on the sidelines. I'm not interested in going long at these levels, but certainly... have ZERO interest in attempting any index shorts until 2030/50. US equities look set to close higher for the 8th day of 10. With a notable strong rebound in the R2K today, it bodes strongly for the equity bulls tomorrow. 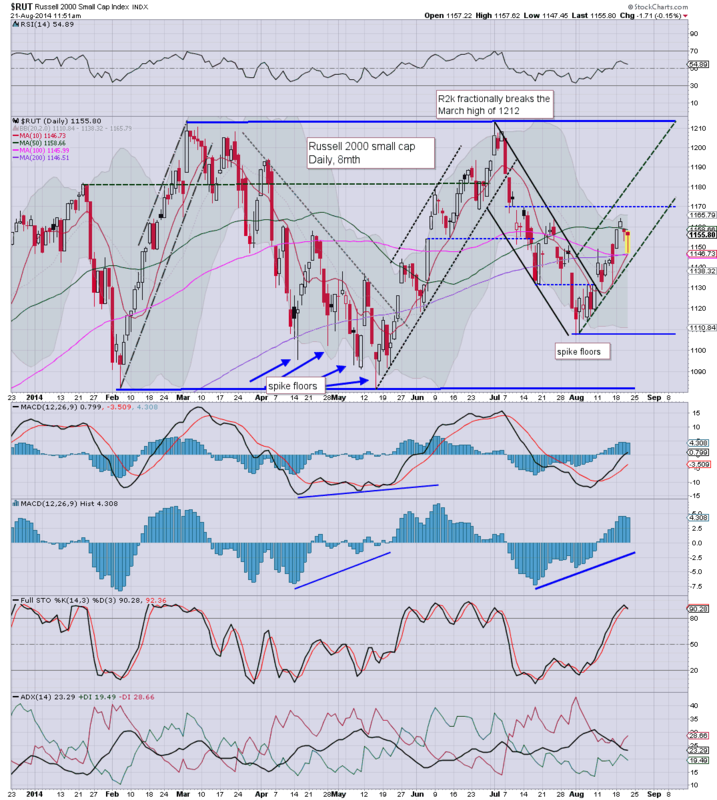 Sp'2000s look set to be hit, with 2010/20s by late August. *Dow is now higher by 400pts this week... the strongest weekly gain since early April. 3.13pm... Clown finance TV wheeling on a doomer.. McClelan this hour. Meanwhile.. sp'1994...and a gap straight into the 2000s tomorrow is viable. I do not expect a reversal until next week.. and even then, we might only be looking at 1.5%...and that will be from a higher level than currently. VIX is in melt mode....the 10s are due tomorrow. First green candle since last December... bodes for further upside in September. 3.25pm.. Notable strength, DRYS, +3.8%... but more on that one after the close.. on my other page. Little to add, on what is just another day in crazy land. Sleepy August... low volume..and we all know that favours the bulls, right? As for Yellen at Jackson Hole tomorrow morning (the nonsense starts at 10am)... we'll surely break into the 2000s.. and melt higher into the weekend. As ever...I've my eyes more on the weekly charts than anything. Best case... .2030/50...then down to 1920/00 by late October. Whilst the broader market is holding moderate gains, there is a notable rebound in the R2K, which makes for a rather powerful spike floor just above the 200 day MA. Upside to 1190/1200 looks viable by mid September. 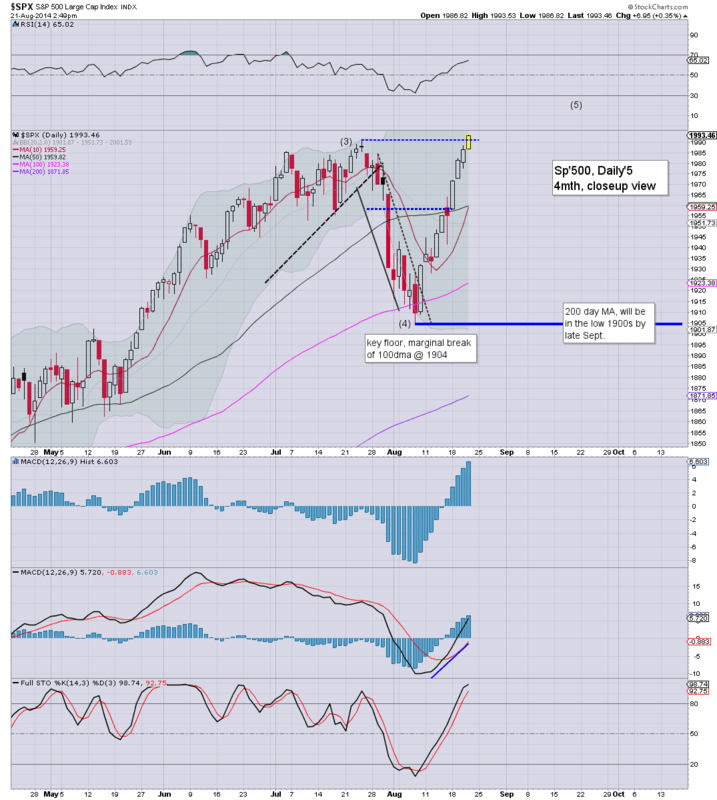 The current daily candle in the R2K is a powerfully bullish one, and bodes strongly in favour of the bulls tomorrow. 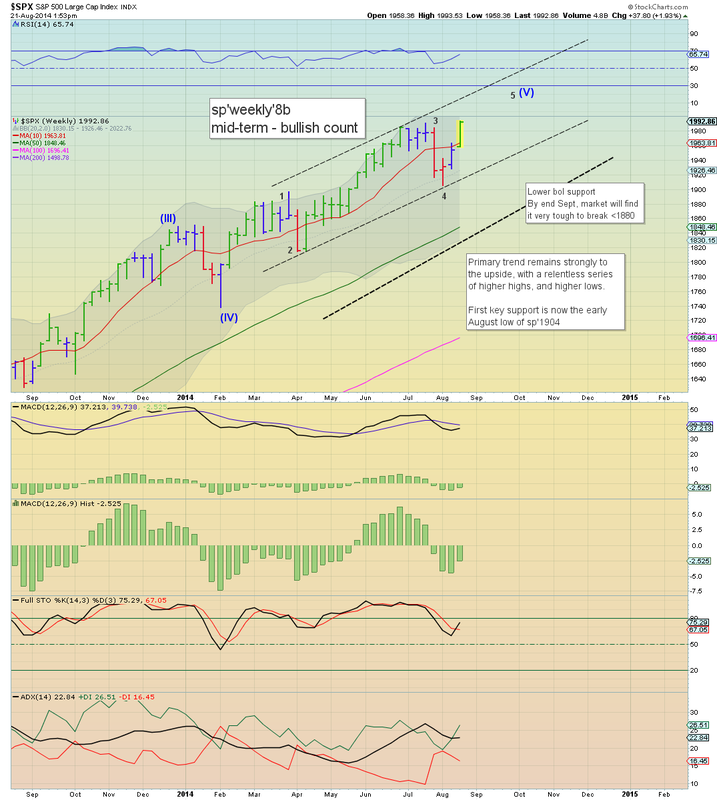 A weekly close in the sp'2000s now looks very probable. So...the inexorable climb continues, and there is little doubt that this mornings QE fuel (if only 1.5/2.0bn) is helping. 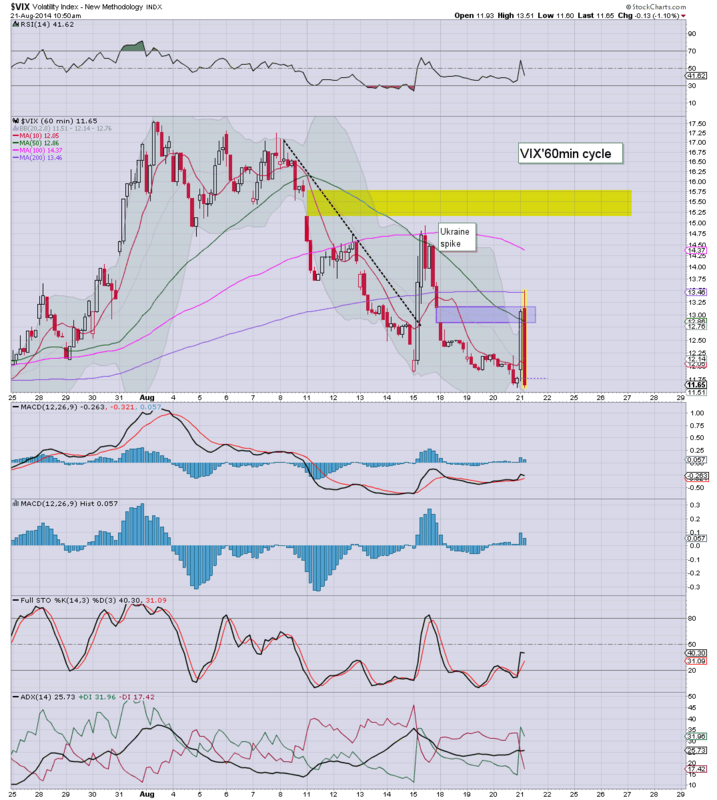 The early twitchy price action in the VIX remains an anomaly.. I've not seen anyone else mention it yet. US equities have seen some real messy action so far. A fractional new high of sp'1992, but the R2K had fallen -1.0%.... but now bouncing back to -0.3%. VIX has seen some bizarre opening price moves. Metals remain weak, Gold -$12. *lower gap zone in the 13s.. filled in the VIX. The 15s would be an obvious target in the next equity down wave. So..what to make of this? Overall... yes, there are some signs of weakness - via the two leaders (Trans/R2K).. but the overall market still broadly on the rise. The fact the VIX is again back to red should not excite the bears about tomorrow. 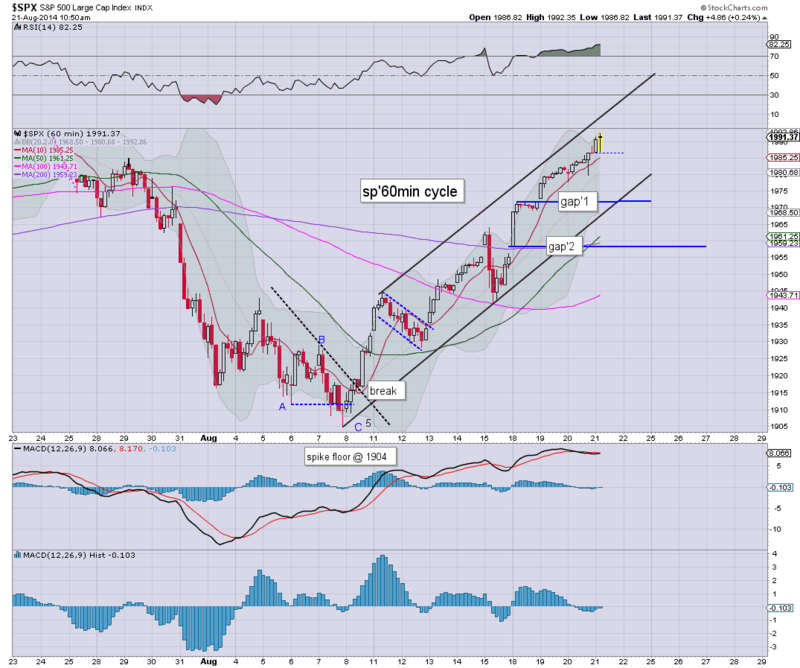 US equities open a little higher, and a new historic high in the sp'500 looks likely in this hour. There is moderate weakness in the two leaders - Trans/R2K, and that is offering an early warning about post Jackson Hole weakness. As even the maniacs on clown finance TV recognise, today the market will largely be in a holding pattern until tomorrow....where we have Yellen at the hole. On any basis, it seems completely point to attempt any index shorts.. not least since we also have sig' QE this morning. Eyes on that VIX ! 10.03am.. and the VIX collapses... back to 11s.... Crazyyyyyyyyyyyyyyyy. 10.11am... So.. a fractional new historic high in the sp'.. but the action in the VIX sure is makes for some curious action. 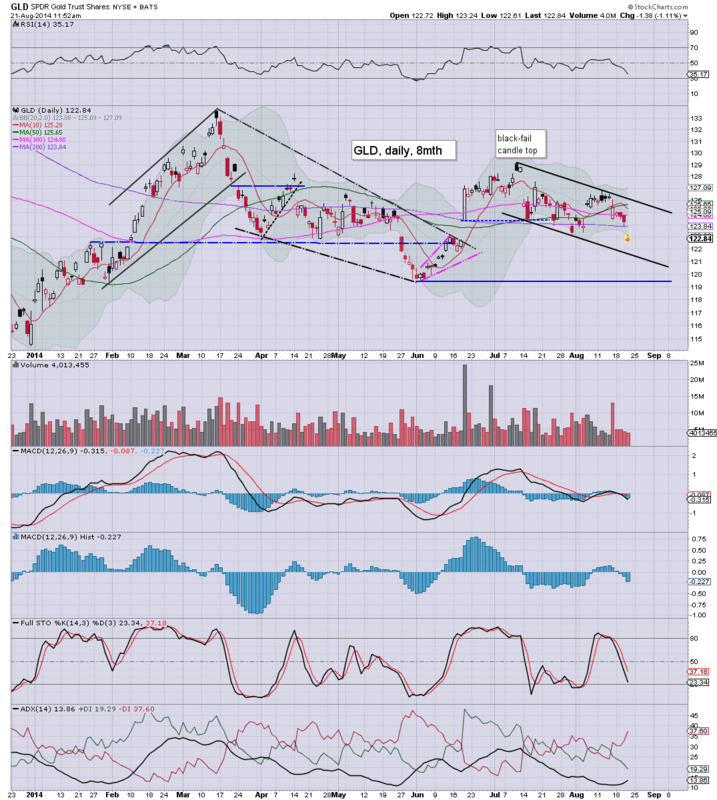 R2K...borderline sig' declines... -0.9%... in imminent danger of losing the 200 day MA. 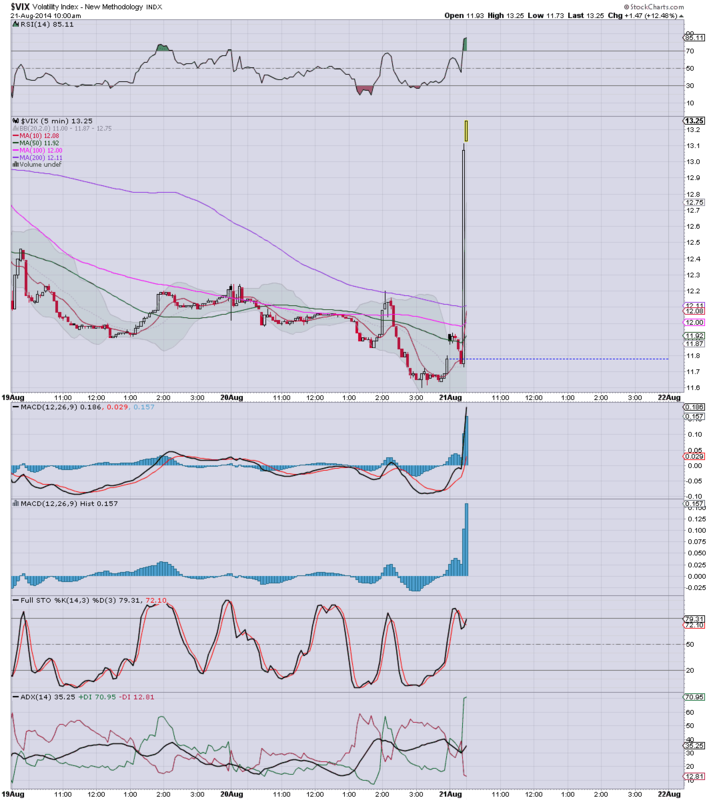 10.27am... VIX turns red... indexes pushing higher... even the R2K looks to be flooring. So... rest of the day...upward melt....ahead of Yellen. Good morning. Futures are moderately higher, sp +4pts, we're set to open at 1990. Metals are sharply lower, Gold -$15. Oil is weak, -0.5%. Near term price momentum continues to swing in favour of the bulls.. with broad equity upside into September. *awaiting an array of econ-data this morning. So.. we're set to break a new historic high in the sp' this morning. 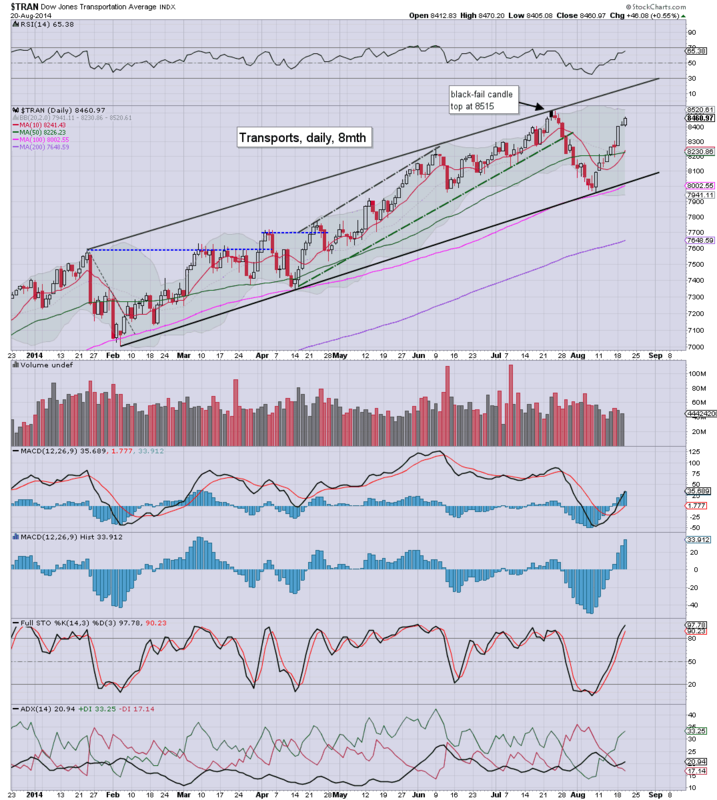 Trans/Dow look likely to follow within days. Equity bears should keep in mind there is QE-pomo of $1.5/2.0bn today. It was just another day for the US equity market, with most indexes continuing to climb. The Nasdaq Composite is now just 11% away from the March' 2000 high of 5132. However, that looks somewhat out of reach this year. It is highly notable that despite all the minor geo-political scares in recent weeks, the Nasdaq is showing a net monthly gain for August of 3.6%. 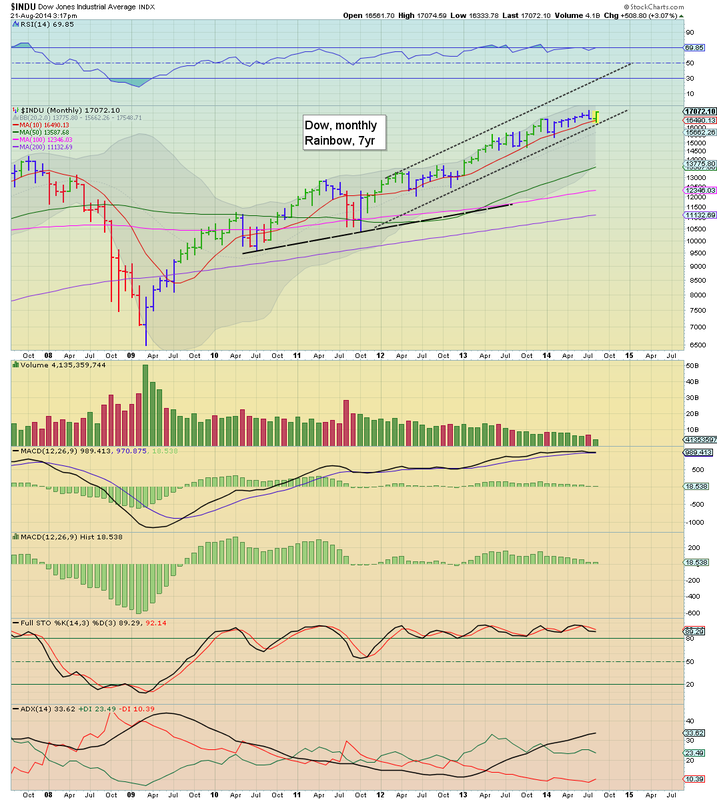 Considering the current price action, a monthly closing gain of 5% now looks very likely. Upper bollinger is offering the 4700s in the immediate term, and certainly, that would be the target for mid/late September. The giant 5000 level looks difficult to hit this year, not least if the market does see some degree of down wave in late Sept/October. Thursday will see an array of econ-data, jobless claims, phil' fed, leading indicators, and some housing data. So...another day higher, and it really is getting extremely tedious..
Best guess remains a key top in mid/late September, 2030/50 zone, but I'm seeing increasing talk of the 2100s again... and that does concern me a little. As things are, the current cycle should complete within 3-5 weeks. The only issue is how far can it fall from there? By late October, the lower weekly bol' will be around 1900, and that would be 'best bear case' in an initial down wave. I suppose some might even be seeking a H/S formation. In the meantime... I am more than content on the sidelines. US indexes generally closed higher for the 7th day of 9, sp +4pts @ 1986. The two leaders - Trans/R2K, settled +0.5% and -0.4% respectively. 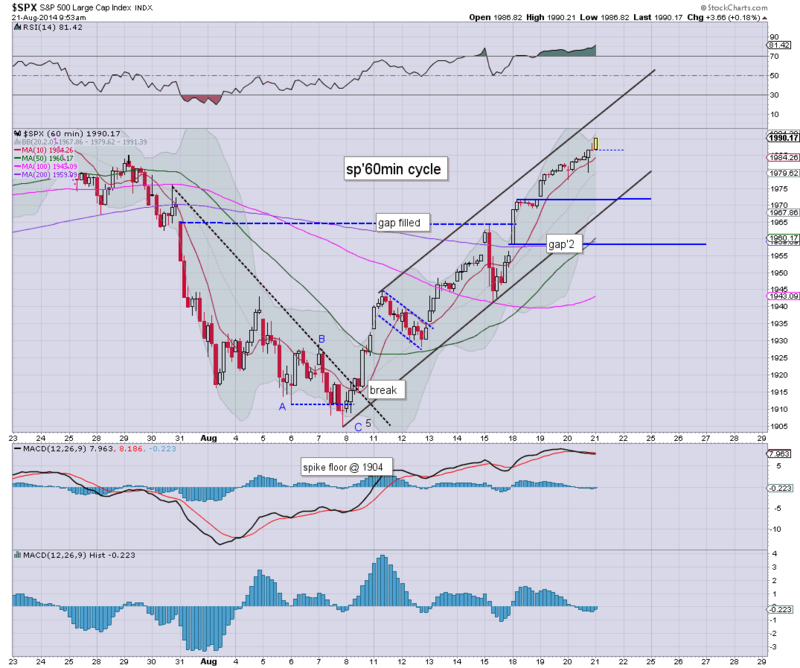 Near term outlook offers sp'2000, before a likely minor 2-3 day down wave of around 2%. 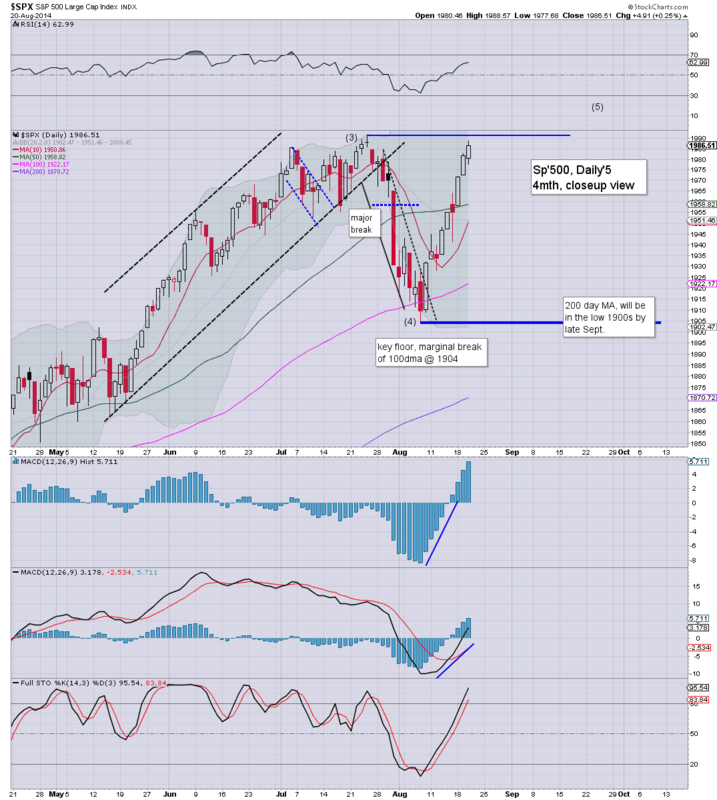 It was merely just another day for Mr Market, some minor chop, but with the usual underlying upward pressure. 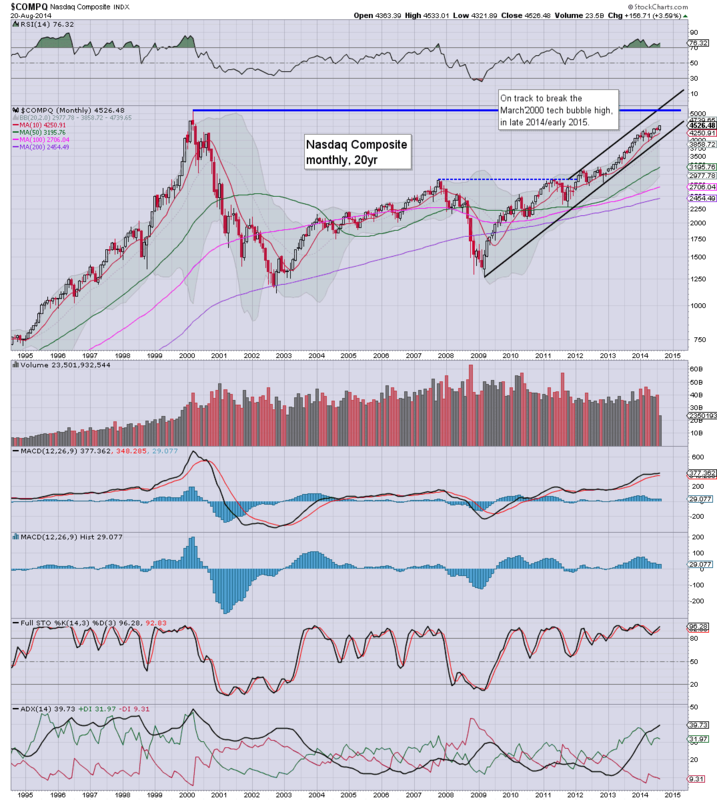 Trans, Dow, SP' all look set to break new historic highs within the near term.